When you think of swimming pool design, the first image that might come to mind could be a large pool of crystal clear water. Before putting the first shovel in the ground or upgrading an older center, many factors need to be addressed for these unique aquatic facilities. 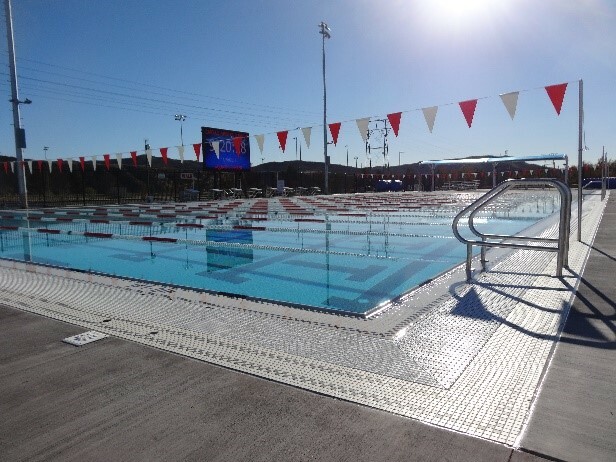 The programming, planning, and rehabilitation of aquatic facilities for both recreational and competitive use include collaborating with clients, the design team, and even end users to create a plan that enhances and optimizes their vision and goals. Many existing indoor natatorium facilities have poor air quality and moisture migration that are the result of years of deferred maintenance, ill-advised HVAC adjustments, and failing envelope systems (allowing water intrusion). To better plan for project needs, it is often necessary to conduct environmental studies to determine indoor air quality and assess whether the systems (building enclosure and HVAC) are contributors to the moisture imbalance and result in less than desired performance. These factors must be considered to truly rehabilitate a failing facility. The resultant remediation plan should address all of the systems beyond just the water-related pumps and treatment systems. As an example, a collaborative effort of our building enclosure and HVAC specialists was required for a higher education project in San Antonio, which included a natatorium and gym with a common wall constructed circa 1990. Initially assessment findings identified a myriad of building issues indicating obvious water intrusion; gaps in mortar joints, debonding of Concrete Masonry Units (CMU), missing weep openings, deteriorated sealant expansion joints, unsealed openings at through-wall penetrations, however, the effort required additional review to address staining and mold growth on exterior walls, efflorescence of exterior split face CMU, corrosion of metallic surfaces in the pool building and fouling of mechanical equipment. A truly multi-disciplined team of professionals with expertise in building enclosure, mechanical and aquatic evaluation, testing, design and commissioning provided the university with recommendations followed by a comprehensive remedial design program to renovate the facility to meet the future needs of the growing higher education campus, restoring it as a showpiece. Aquatic projects have the potential to pose interesting challenges. 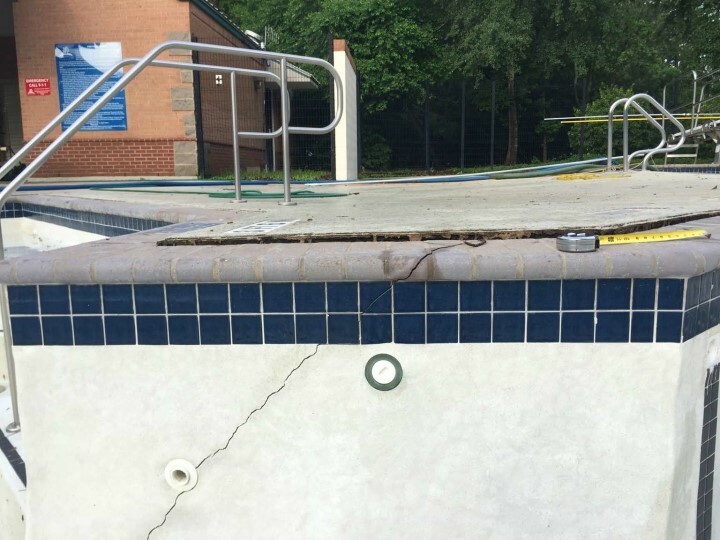 A unique one is known as a “floating shell.” This occurs when hydrostatic pressure below the pool floor is so significant that when a pool is empty, it pushes the shell upward, creating large cracks, leaks, and destroying pool piping. Once again, several different disciplines are needed to accurately address the related issues—geotechnical study which provides structural engineers with the best information to minimize foundation design issues while meeting applicable building codes and standards. Additionally, design standards to the pool engineering should be developed by a plumbing engineer to ensure that the system provides hydrostatic relief valves in each main drain sump and a sight sump to allow pool operators to view the in-ground water level with respect to the bottom of the pool prior to any pool draining procedures, thereby avoiding movement of the pool shell. Swimming pool shell engineering is critical component of the overall aquatic design, not only for slab-on-grade pools, but exposed or elevated shells. As an example, on an indoor natatorium project in Pittsburgh, Pa., Terracon was retained to determine the cause of leaking of a pool shell over occupied space below, that was installed only months prior to the evaluation. A pool shell water tightness test detailed leaks from many locations around the 8-lane by 25-yard competition pool into occupied space below the deck. There were obvious indications of design, installation, and materials quality issues. 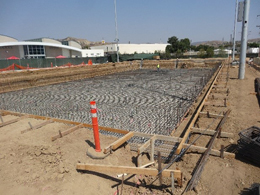 Concrete remediation recommendations and compatible waterproofing membranes were designed and remedial actions taken such that the tile setting manufacturer warranty was not voided. As a result, a water tight pool shell was restored and 25-year tile warranty was provided for the desired result on this new facility. Making a splash with an aquatic facility is the easy part. Maintaining the facility performance for the intended use and long-term return on investment requires awareness of a myriad of issues to be addressed during the design and construction of any new facility. In addition, due to the complex nature of these facilities and their operational and often hostile environments related to building components, rehabilitation requires a team of multi-disciplined professionals working together to assess and restore the facility for its intended use. This will continue to challenge the industry as owners look to provide even more complicated and sophisticated aquatic facilities in a variety of building settings. Matt Cappello, P.E., is a senior engineer for facilities and aquatics in our St. Louis office.